I’m always on the lookout for a different angle on Australian football, for that little gem below the mainstream surface. Dreamteam, standard AFL merchandising and the Footy Show leave me cold and empty. There must be something more! Well there is. 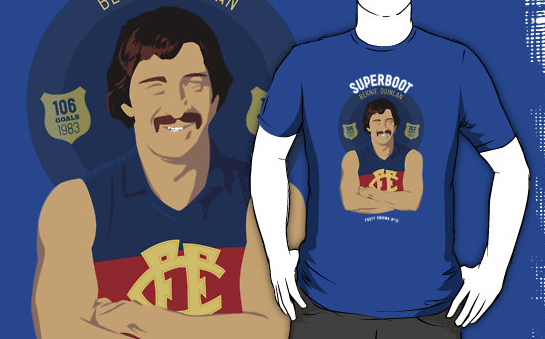 It has been with great interest that I’ve watched a most unique series of footy t-shirts develop. 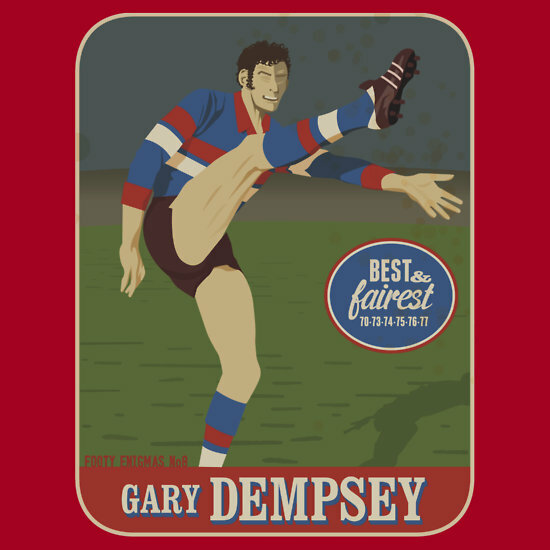 I’ve kept in close contact with t-shirt creator, Chris Rees, who has been inspired by his childhood love of footy cards. Whilst my own footy card obession was short and intense from the years 1988-1990, Rees offers an earlier view, drawing on his 1975-79 Scanlens collection. 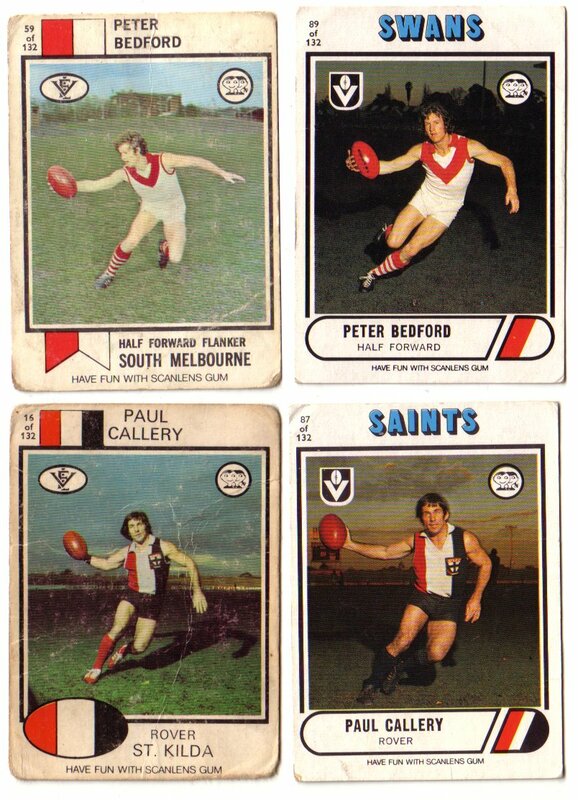 On display is one of the classic footy card poses, the camera balk. with ball tauntingly held in cameraman’s face. Growing up on the North West Coast of Tasmania meant that Rees relied on three things for his VFL fix as a kid; the wireless, The Winners and of course, Scanlens footy cards. As the name suggests, this isn’t the ‘A-list’ of VFL stars; the Harts, the Jesaulenkos and the Keith Greigs. (I know, there was only one of each, but I just love this ‘footy-speak’) Rather, these t-shirts celebrat the cult heroes, with the odd champ thrown in for good measure. So dust off your old footy cards and compare notes as we take a look at the players chosen, one from each old VFL club, in club-by-club alphabetical order. 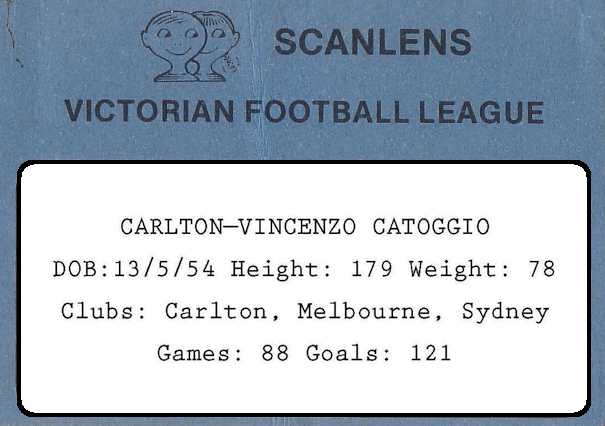 When talking ‘cult heroes’ it’s hard to go past one Vin Catoggio. His unique hairstyle and catchy name has helped him stay in the current footballing fan’s mind. I like how Rees has used his hair as his defining feature, without need for mouth, eyes or nose. “I always loved his name and his afro, and they way he defied tackling. His story grabbed me anew when I read Brent Crosswell’s account of the 1973 Grand Final. It was Vin’s first game and he didn’t make an impact – something it took him a long time to get over” recalls Rees. I said that there was a champion or two in the mix, and Peter McKenna certainly fits the bill. With his mop-top of hair and a short lived career as a singer, McKenna’s finest work was still done out of the goal square dressed in black and white. However he fits the quirky nature of this range of t-shirts. “I was tempted by Rene Kink, Billy Picken and Ron Wearmouth but the sealer was when someone gave me a book with frame-by-frame pics of his kicking style, with his Beatle mop flopping about.” (You can see the frame-by-frame images of McKenna in the first short video here) Add to that McKenna’s ‘Hey Hey it’s Saturday’ connection of being ingloriously replaced as co-host by Ozzie Ostrich, and he’s right at home here. 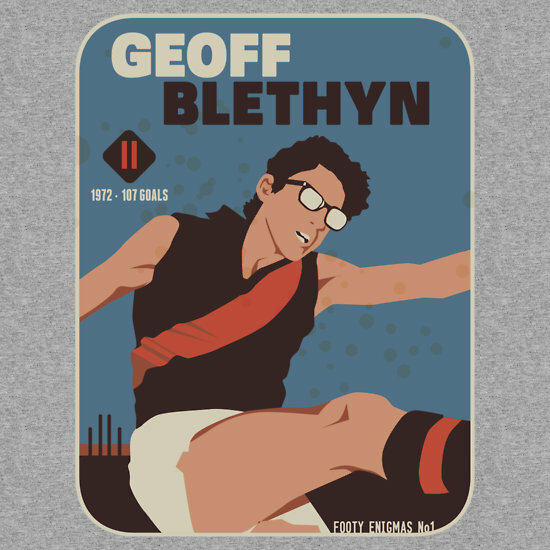 The bespectacled full forward Geoff Blethyn is another whose unique appearance on the footy field has kept him in the public eye all these years later. Unfair really, given that he did kick 100 goals in a season. 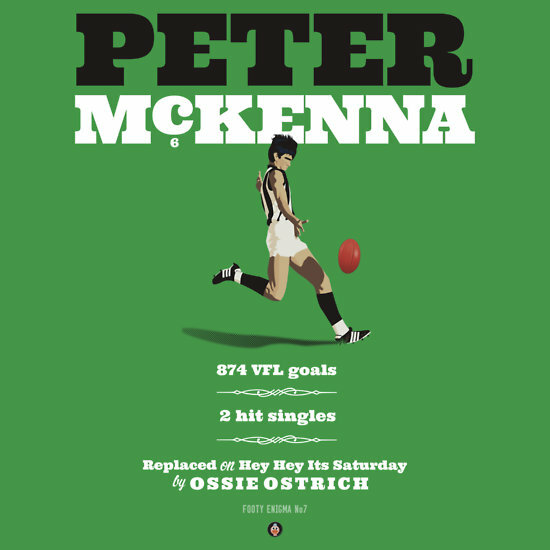 If McKenna were the Beatle-esque footballer of the time, then Blethyn can be described as the VFL’s Buddy Holly. A recent Age article by Peter Hanlon celebrated both Blethyn and this range of t-shirts. It’s great to get Geoff’s reaction to being ‘immortalised’ on fabric. ”We’re all a bit quirky in our own way,” was his take on the players selected. Quinlan spearheaded the Roys to a final tilt at the ultimate success in both their 1983 and 1986 finals campaigns. The Roys fell short on both occasions. In a career of two halves, Bernie played for 9 years at Footscray before heading over to Fitzroy where he equally spent 9 seasons. At this point in time, he is ranked 7th on the all time games played list. The Dogs didn’t have much going for them while Dempsey was around. Sometimes a player can keep a club going in tough times in terms of giving fans something to cheer about. It reminds me of what Matthew Richardson meant at Punt Road. 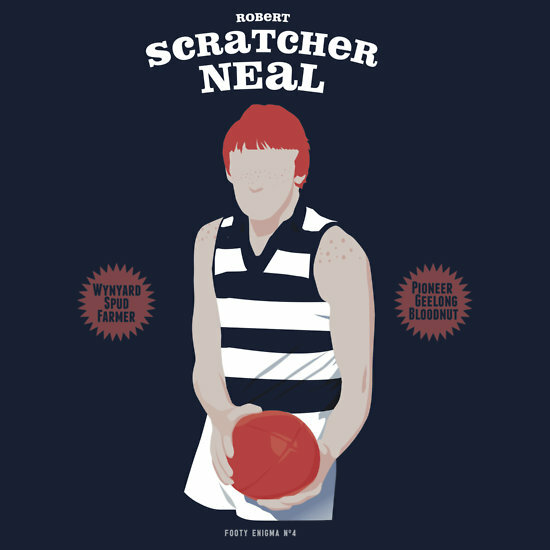 To be honest, other than knowing the name ‘Scratcher Neal’ and that he played for Geelong, I knew not one thing else about the man. In my research, I came across this great little piece on Scratcher on the ‘the terrace’ website. And to me, this is what Rees’s t-shirt series is all about, bringing long forgotten footballers back into some form of limelight. “I love his nickname and that he’s that he’s from Wynyard (Tasmania-also the Cats) and his outrageous red hair. In his card from 1982 his fringe is ruler straight and his hair is a shiny copper helmet.” says Rees of this Geelong wingman. And the nickname Scratcher derives from his background as a potato farmer! A great addition to the enigma series. If ever there was an enigma, it was Michael Tuck. He has played the most games of league football in history, virtually an extra season’s worth than his nearest rival Kevin Bartlett. Consider also that he also played 50 games in the reserves before consolidating himself in the senior side! Remarkable longevity. “I hate Hawthorn, so this one was always going to be a challenge. But Tucky never whacked anyone, never grandstanded, never staged for a free – just kept going and going and going. 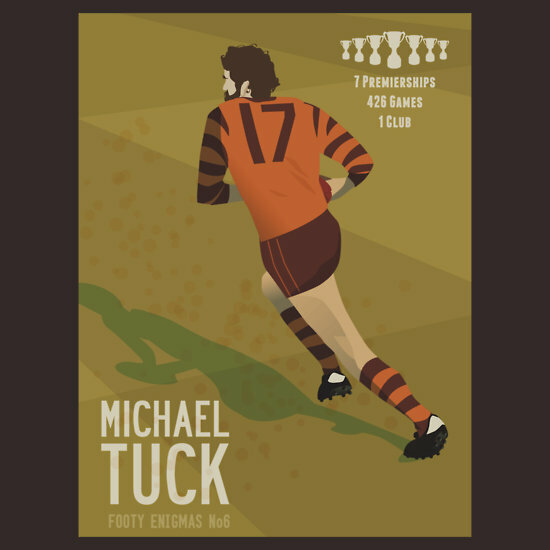 I didn’t think any of his footy cards really captured Tucky so I painstakingly drew this one from a bleary frame taken from YouTube.” His wiry frame is indeed captured here. As are his 7 premiership cups! 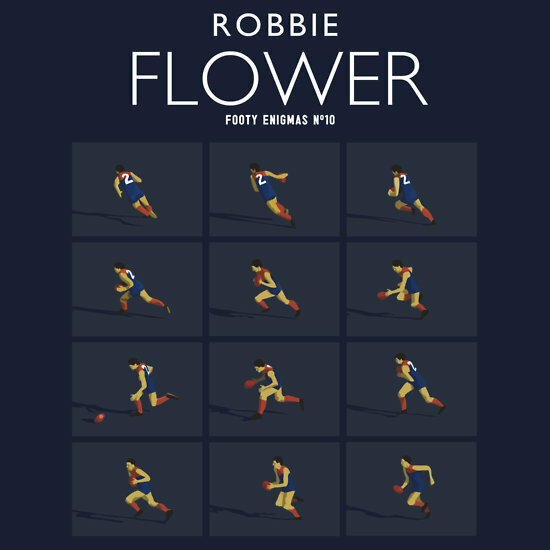 Robbie Flower is responsible for one of my very first footballing memories. It was in his Forest Hill sports shop, served by him, that I brought Dale Weightman’s iron-on number 3 to put on the back of my Richmond. 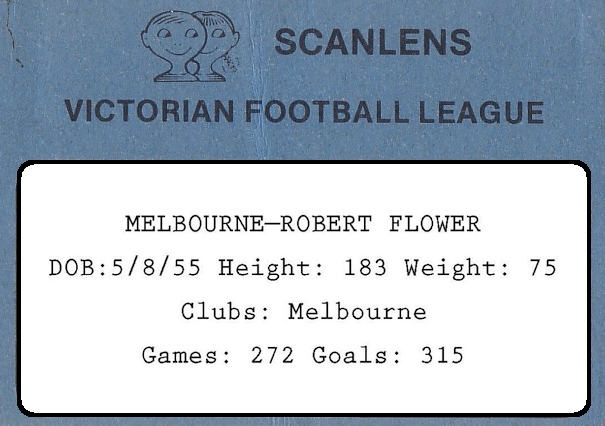 Flower is the the first league footballer I can remember laying eyes upon. I agree that the sense of balance and movement you get from theses ’12 little Robbies’ encapsulates the great man well. “It’s mysterious how it’s established wisdom that he was Melbourne’s only good player for about a 10 year period and came out of it with ONE best and fairest.” says Rees. A trivia question I would most certainly have gotten wrong. I particularly love the cery 1970’s moustache and hair which David Dench is sporting in this image. If you averaged every white Australian male from the 1970’s, then David Dench is what you’d end up with. 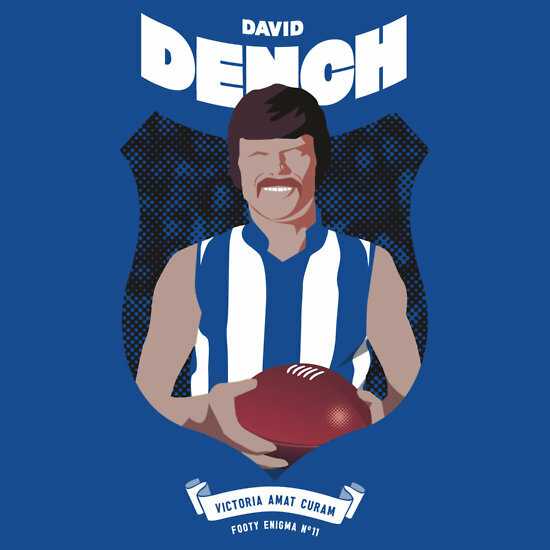 Dench certainly played out of his skin in the drawn grand final. His move forward provided a catalyst in the final term, and he kicked 2 of his career’s 29 goals on this day. A week later, he held aloft the premierhsip cup. 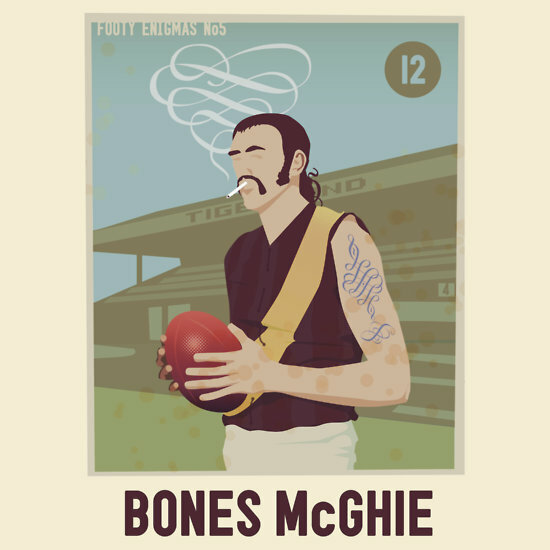 View Rennie Ellis’s glorious photograph of Bones McGhie HERE! I’m not too sure what needs adding here, other than to say I get a thrill whenever I end up at the local supermarket at the same time Bones does! As a Tiger I’ll be sure to add this ripper to my wardrobe. 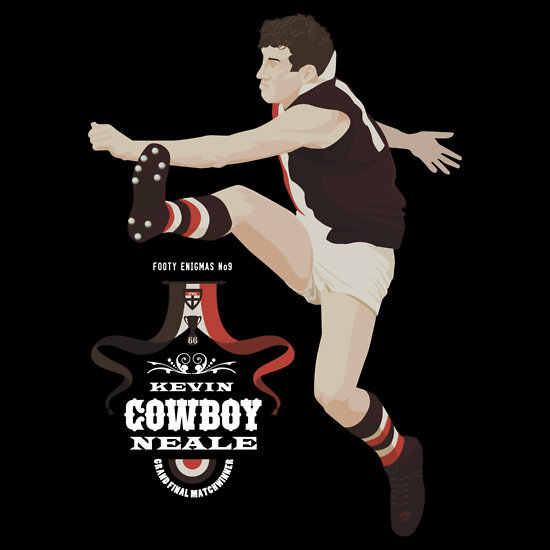 Cowboy Neale is often remembered as the bloke who king hit Peter Hudson in the 1971 grand final. The hit caued Hudson to miss a string of gettable goals which left him stranded on 150 sausage rolls for the season, just one shy of breaking the record. However Cowboy often misses out on the true adulation he deserves. “I always thought of him as a lovable rogue, with a reputation for biff. I was surprised when I looked into it that he basically won the 1966 flag off his own boot, but old Barry Breen gets all the press.” says Rees of his choice for Kevin Neale. Finally we come to Peter Bedford, another name I’m glad that Rees has brought to light. I actually know the name very well, a Brownlow Medalist who grew up barracking and playing for Port Melbourne in the VFA before joining South down the road in the big league. But what I didn’t know was of his love for cricket and that he represented Victoria 39 times as a batsman/leg-spinner. Sounds like the exact thing the national team needs right now! And upon finding Peter Hanlon’s piece on Bedford from late last year, I learned that cricket was his first love! So where can I get myself one of these t-shirts? 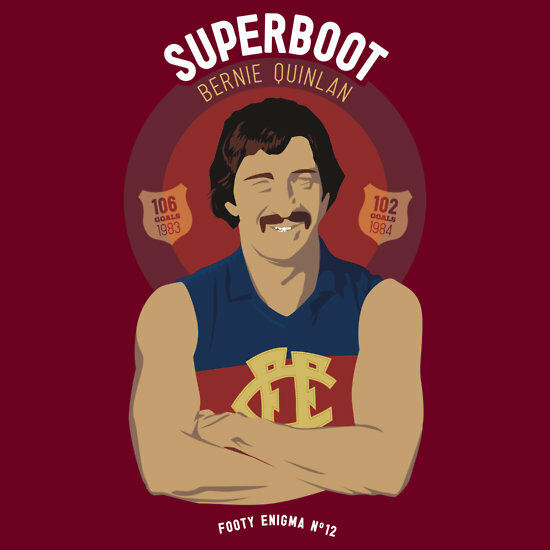 An example of how the Quinlan t-shirt comes up on this very pasty Fitzroy supporter. You can also follow Chris on twitter @4Boat if you would like to make contact or have any questions about a purchase. 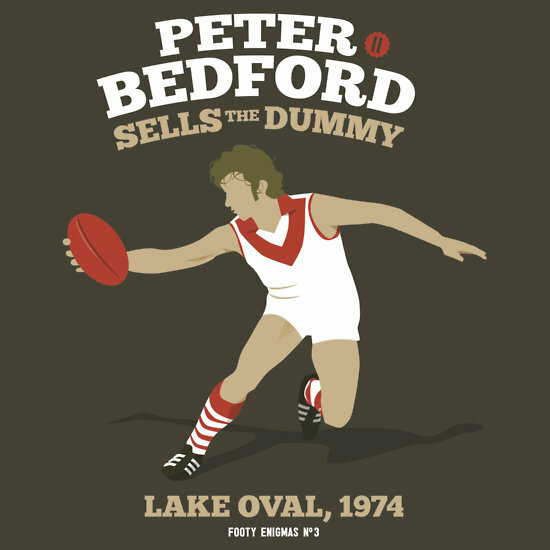 I think these shirts and designs are just the sought of thing that needs to be injected into the often sterile AFL marketplace, and I look forward to seeing them proudly worn at the footy. As Molly Meldrum would say, (whilst wearing the Cowboy Neale hoody) do yourselves a favour! This entry was posted in Musings and tagged 1970's, afl, Bedford, Carlton, clothing, Collingwood, essendon, Fitzroy, footscray, Footy, footy cards, Geelong, Hawthorn, Melbourne, North Melbourne, Peter McKenna, Quinlan, Richmond, Robbie McGhie, Scanlens, South Melbourne, st.kilda, tee-shirts, Vin Catoggio by theholyboot. Bookmark the permalink. surface was then uneven and often very muddy. use today in Australian Rules football. 1960 played in a Premiership team for Croydon. The Ringwood Mail, August 1951.
name for Johnson’s Stab Punt. Frank Casey, The Post, September 8, 1960. – he has found the lost art’. Yarra Glen oval, 7 May 1949.